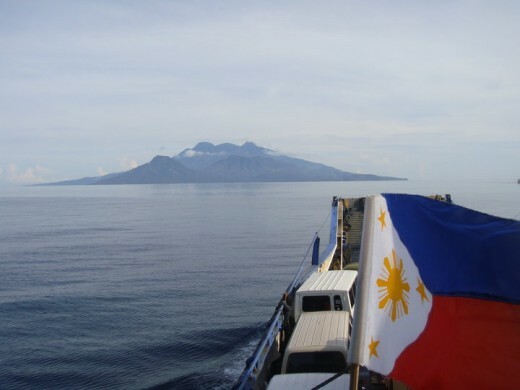 This is my beloved home for 10 years - CAMIGUIN ISLAND, PHILIPPINES. 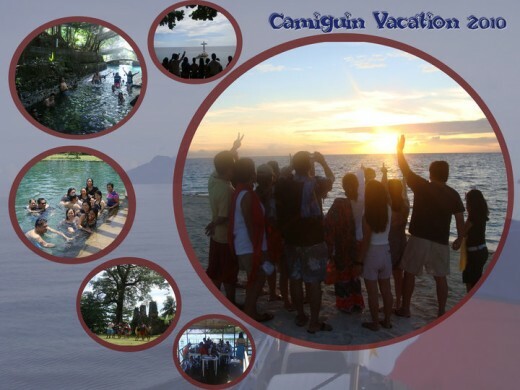 I visited my home island Camiguin with my colleagues (teachers from Merry Child School). Sadly, I was not able to visit my hometown. But this is still the best vacation I had with my home island. 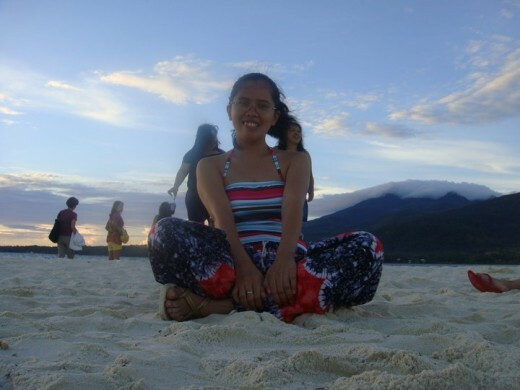 This is my photo taken at White Island, the mountain at the back is Camiguin Island. This island vanishes when the tide goes high. 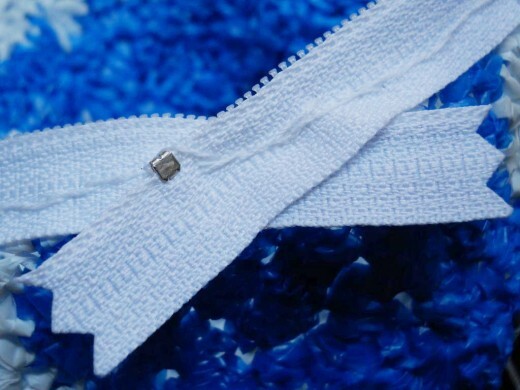 I looked at the plarn I have and I had ample amounts of blue and white. Perfect! What if I worked shells and dc-togs alternately? 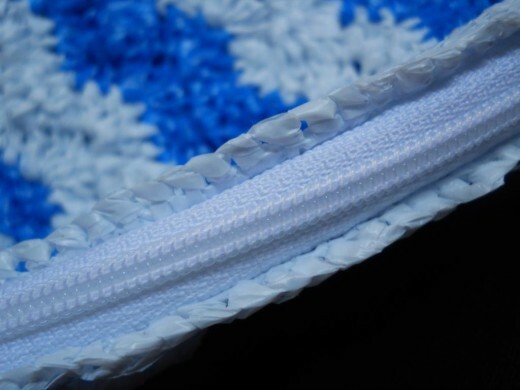 That should result into a wavy pattern. 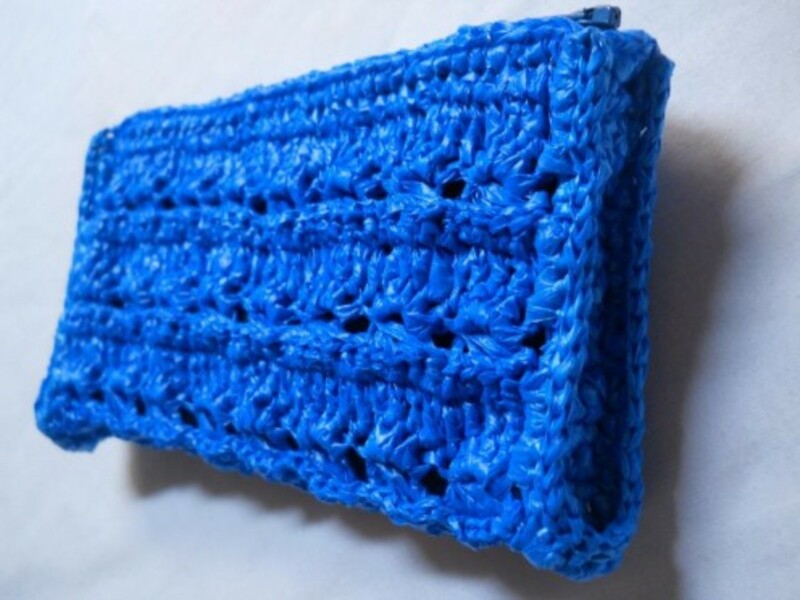 My journey towards crocheting with plarn was a complicated one but I found a lot of good reasons to stick with it along the way. 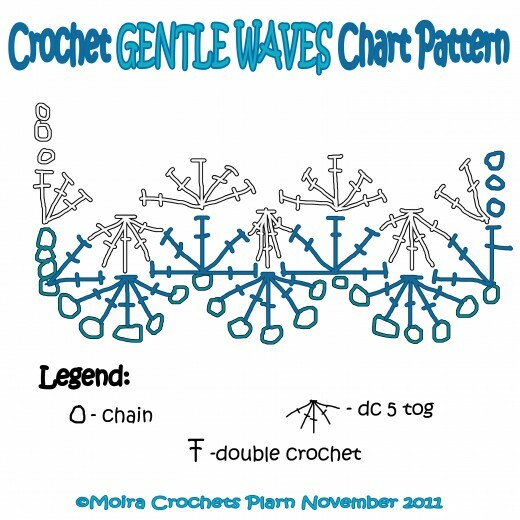 The stitch pattern is a simple repetition of dc increases and decreases. 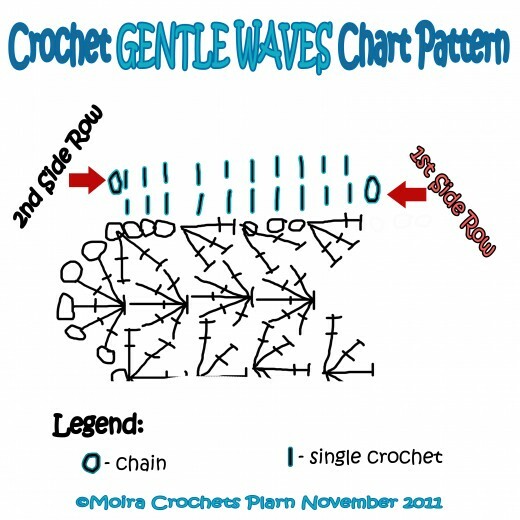 Perhaps I am not the first one to make this stitch pattern. 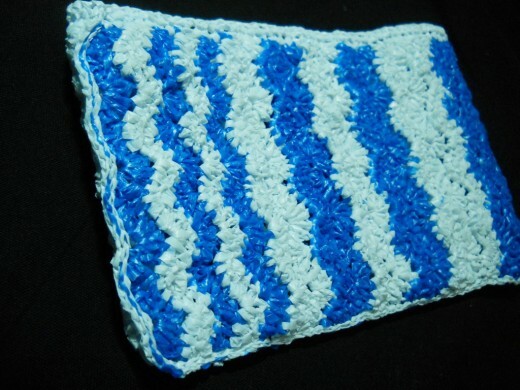 But a wavy pattern such as mine is not yet an overly used stitch pattern. 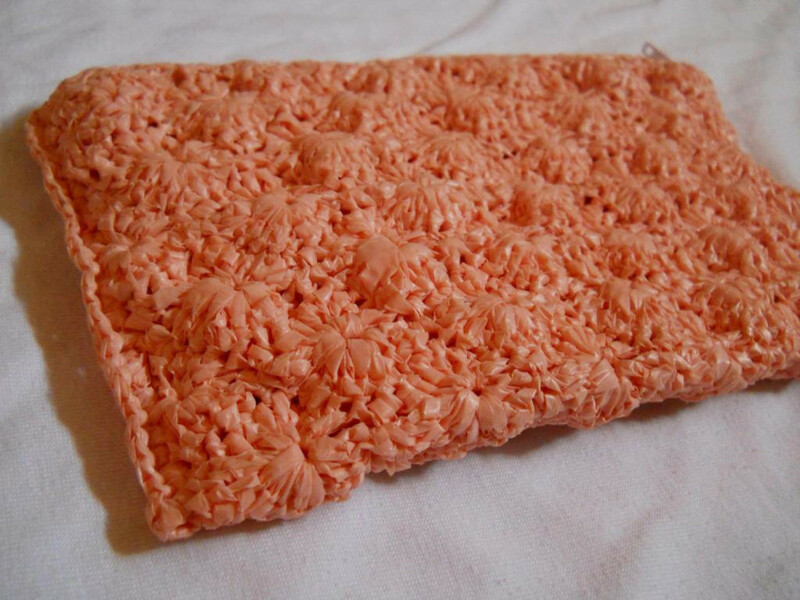 Which is such a shame considering how easy it is to crochet and how beautiful the resulting crochet cloth is. 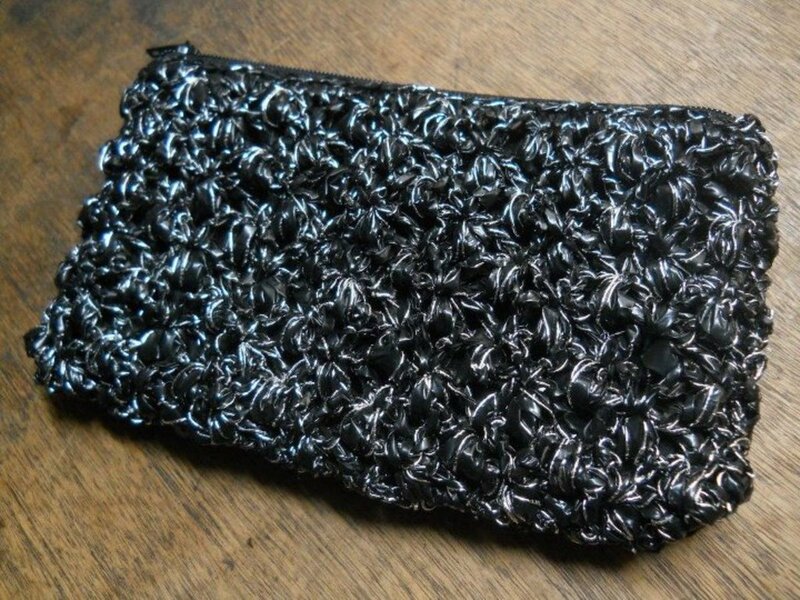 Although I used it here as a pouch, but it would look lovely as a scarf or belt too. 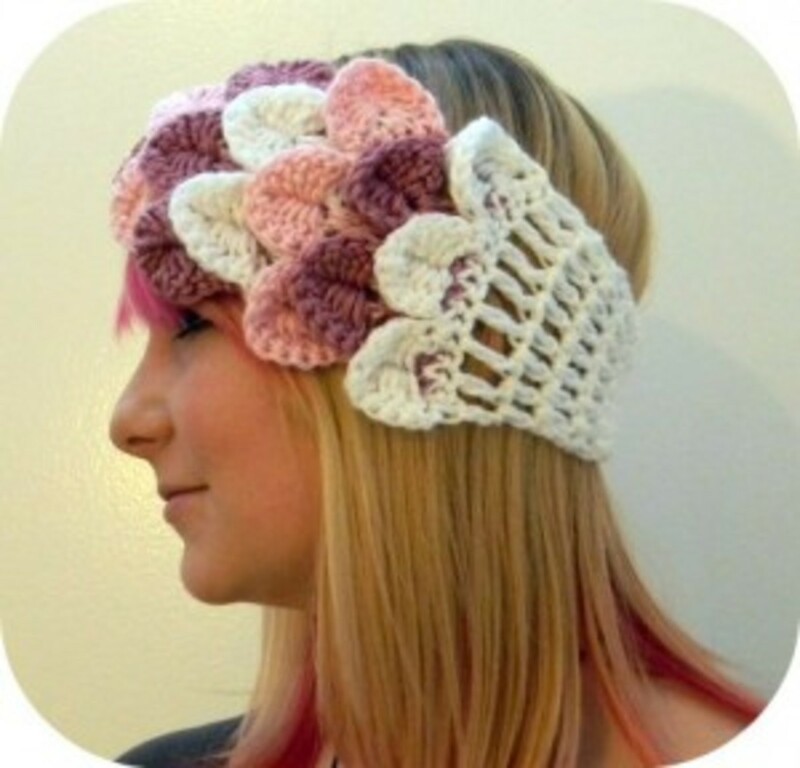 It would also work well for an afghan. 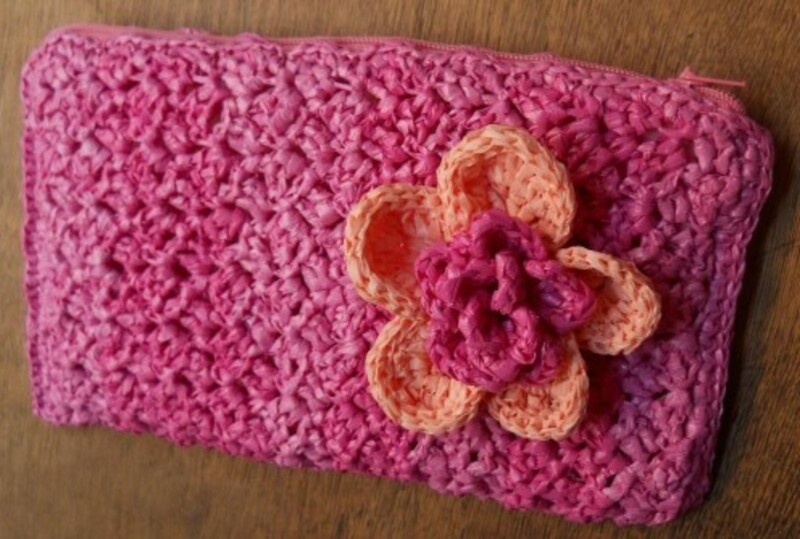 Having a variety of colors would also make the stitch pattern pop. 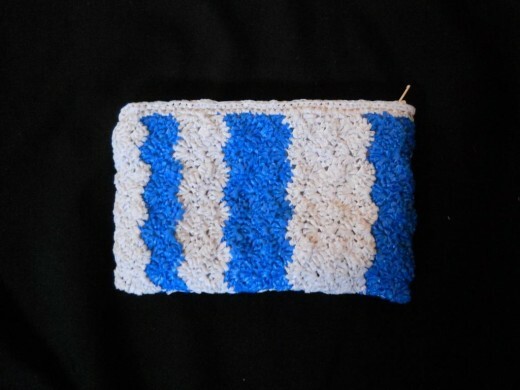 Upon experimenting with my pouch I realized that the best number of rows for each stripe is 3. But that's just me. 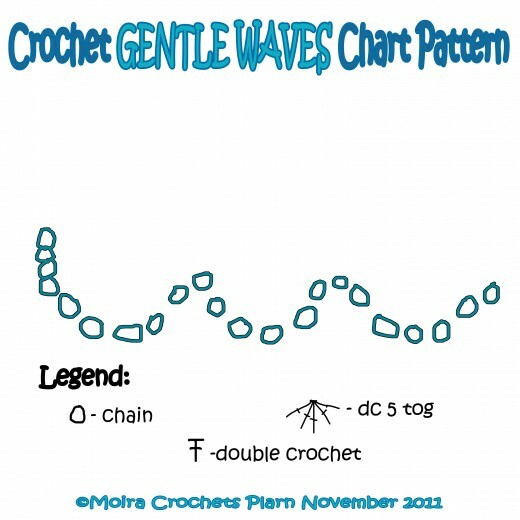 I hope you use this stitch pattern for other stuff, too. This pattern uses American notations. 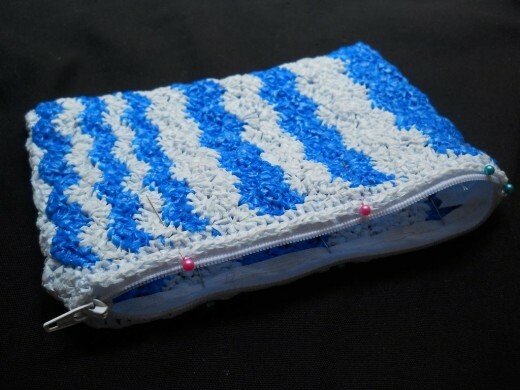 For my GENTLE WAVES Pouch, I used blue and white 1/4-in single strand plarn cut from medium sized plastic bags that's thin and very pliable for crochet. I didn't need to condition it. 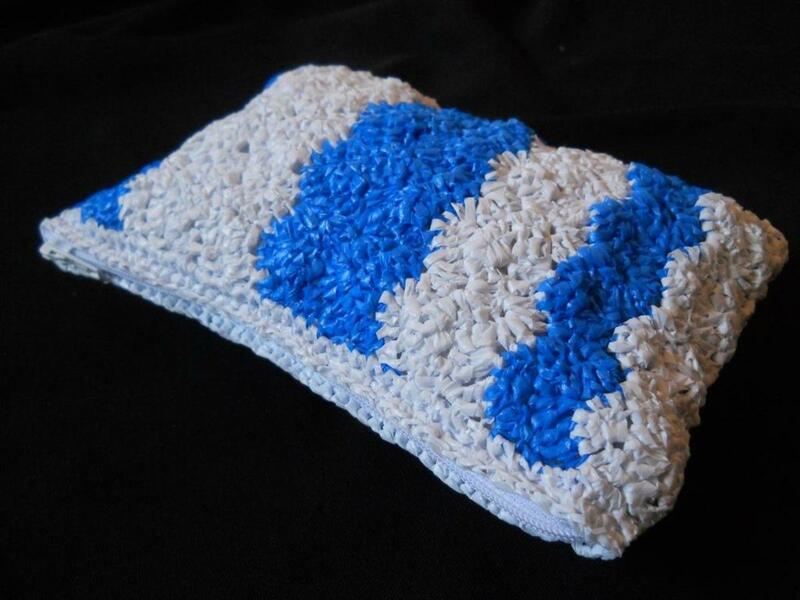 I wanted it to be soft so I crocheted it using a #4 yarn hook. The white zipper is from YKK and the lining is from my old blouse that don't fit anymore. 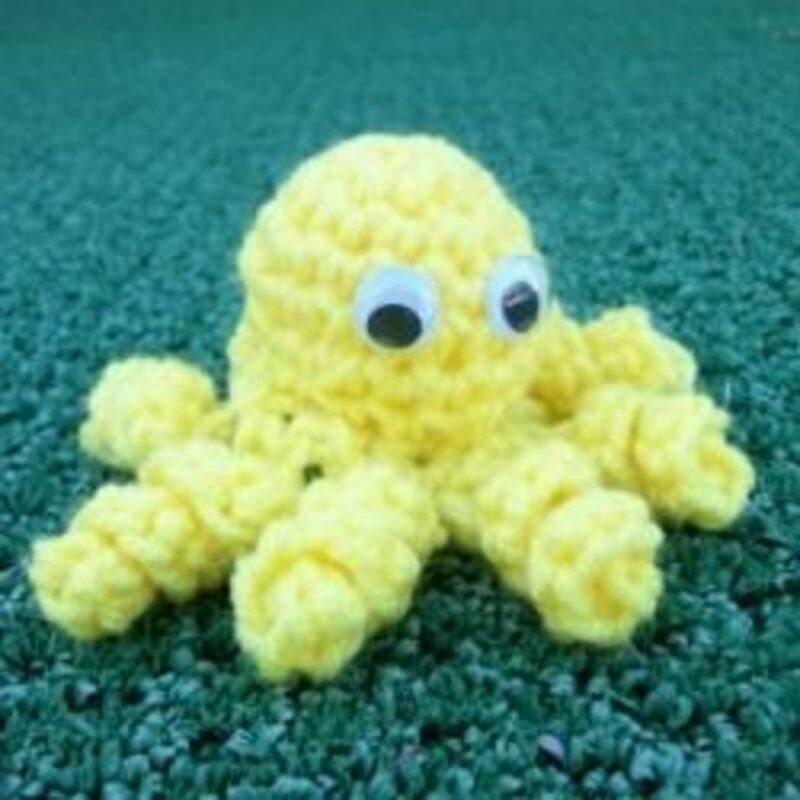 How to Crochet a dc2tog? 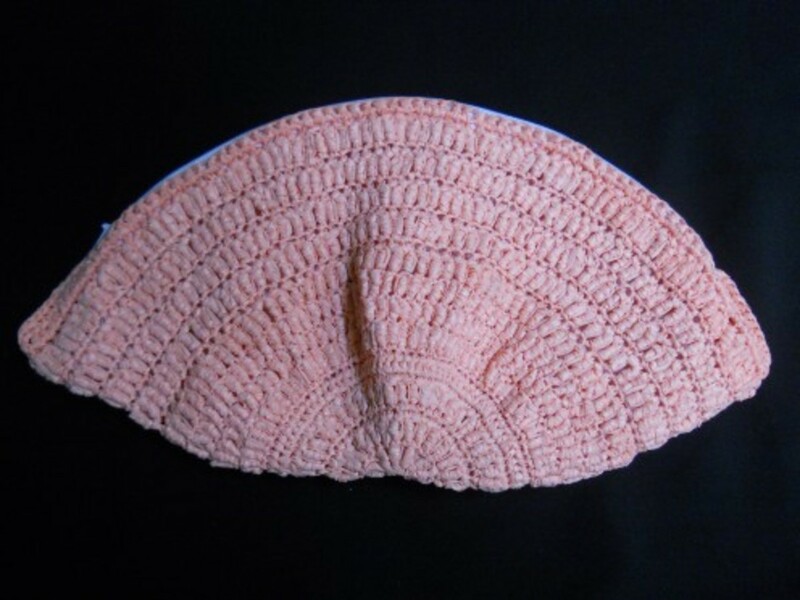 In crochet, shells are defined as a group of 3 or more stitches worked in the same stitch or space with at least one dc stitch. 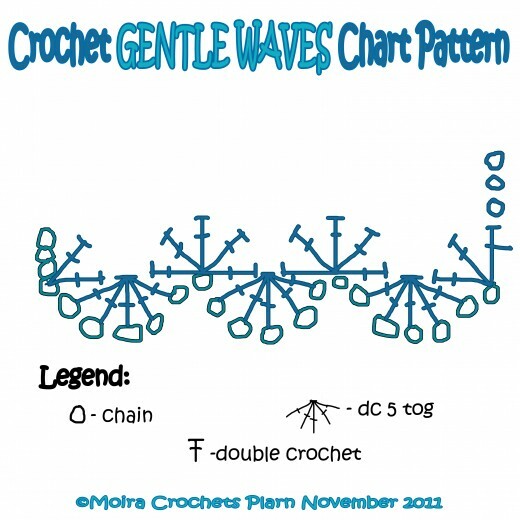 For this pattern, it refers to a group of 5 dc's worked in the same stitch/chain. Shells are also used to increase the number of dc's. 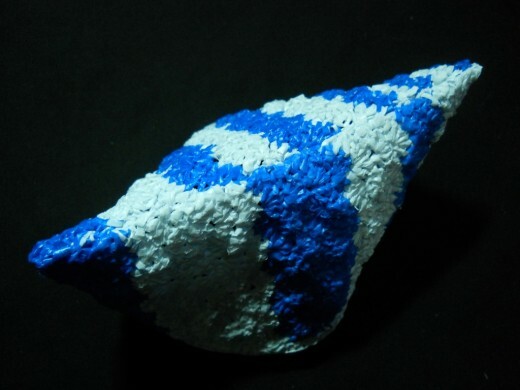 Shells are quite easy to understand. Dc-togs are a bit challenging to grasp at first. The video shows how to make a dc-2-tog. 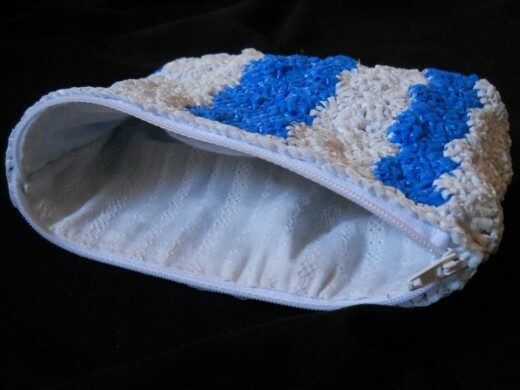 The pouch is first worked as a strip. The side of the strip is lined with sc's twice. 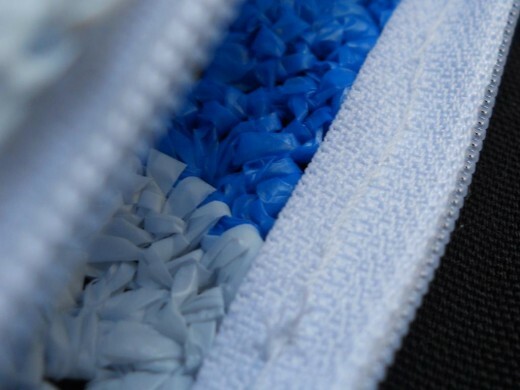 The zipper will be attached to these side. 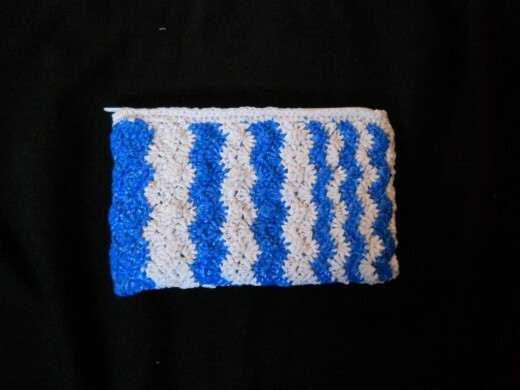 Then the strip is joined to form a coil with slip stitches. 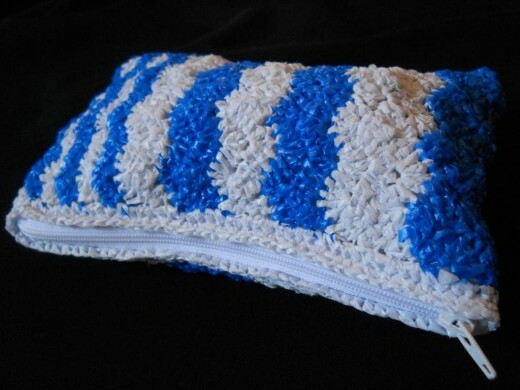 The remaining side will also be stitched to serve as the bottom of the pouch. 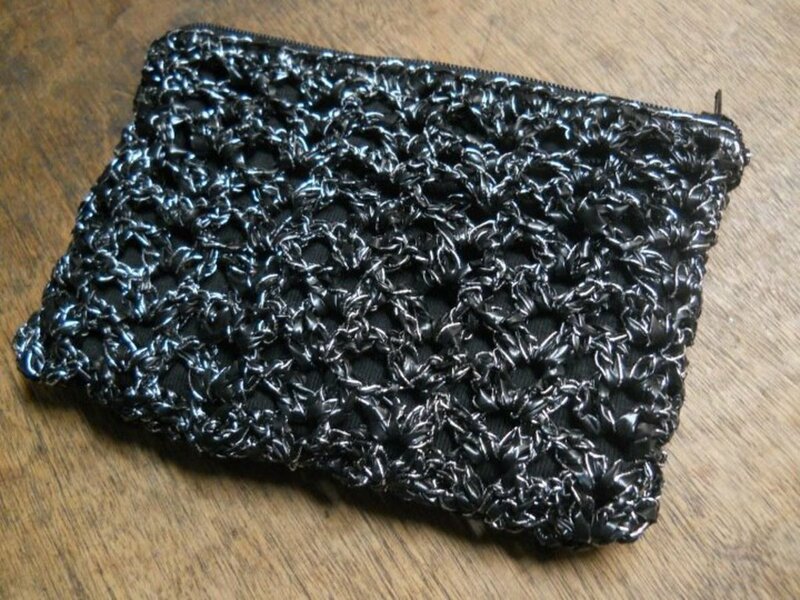 The foundation chain I wrote for this pattern is NOT the actual number of foundation chains that I used for the pouch. 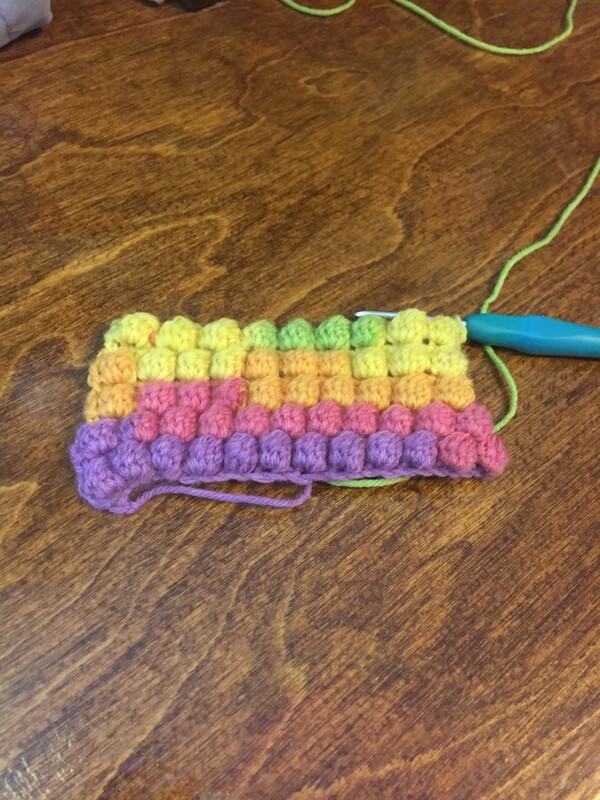 While crocheting the side of the strip I realized that it will be difficult to locate where to insert the hook once you begin working sideways. The colors I used in each row are indicated in the table to the right. Row 1: Alternate dc5tog and dc shells. Row 2: Same as Row 1, repeat for pattern. Side Row: Work on the side of the strip formed. Take note of FIRST SIDE ROW, zipper will be attached there. 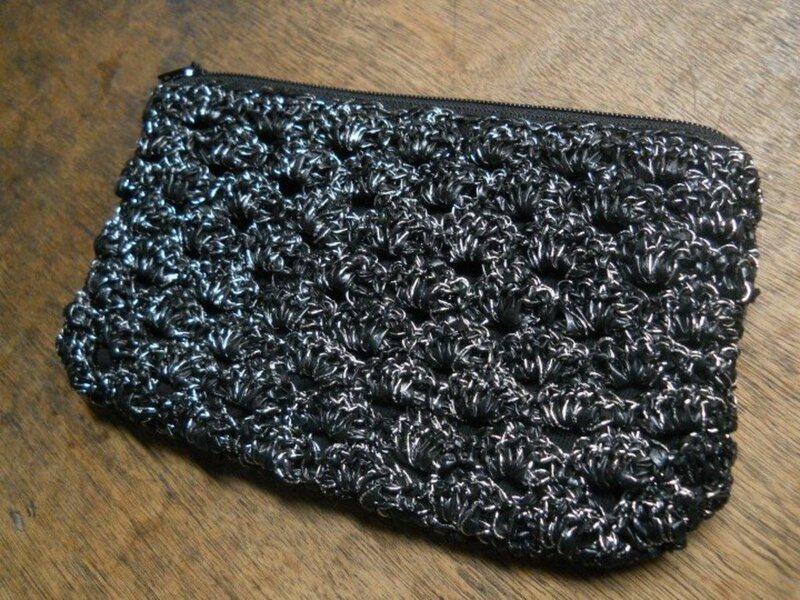 Close up on the bottom of the pouch. Foundation Chain: Ch 29 (or a multiple of 6 + 4). Row 1: Sk 3 ch, 2 dc in next ch, (dc5tog, 5 dc in next ch) repeat until 6 ch are left, dc5tog, 3 dc in last ch, ch 3, TURN. Row 2: 2 dc in the 1st dc, (dc5tog, 5 dc in next st) repeat until 6 sts are left, dc5tog, 3 dc on top of turning ch, ch 3, TURN. Repeat Row 2 38x or until length is sufficient. [Side Row: Ch 1, 5 sc every two rows, TURN.] Repeat 2x. Use sl sts to sew the side and bottom. Stitch the zipper to the FIRST SIDE ROW. Why? 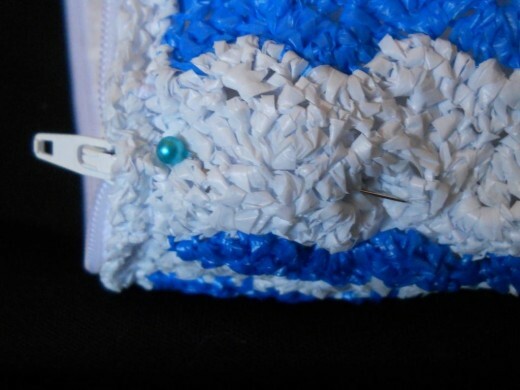 So that the stitch is far from the zipper's opening. 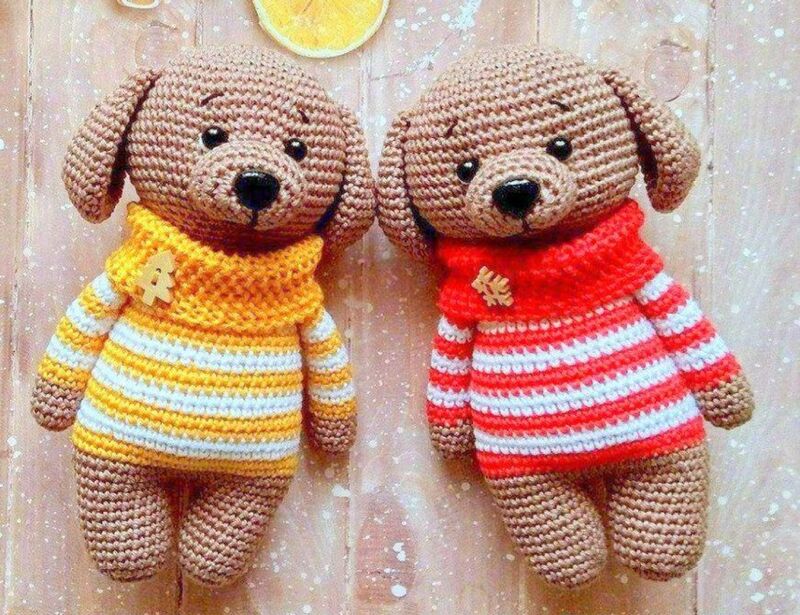 Stitch this end at least three times. 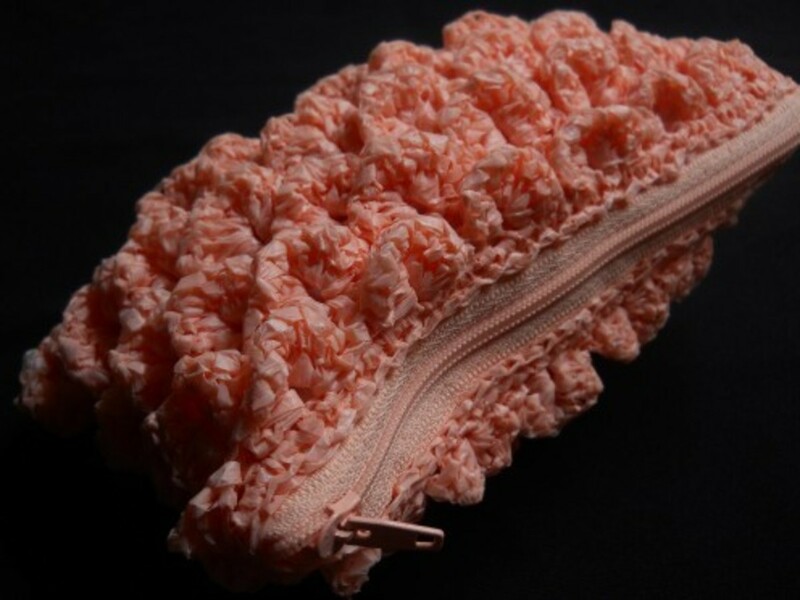 It will receive a lot of stress and stretch when the pouch is opened and closed. 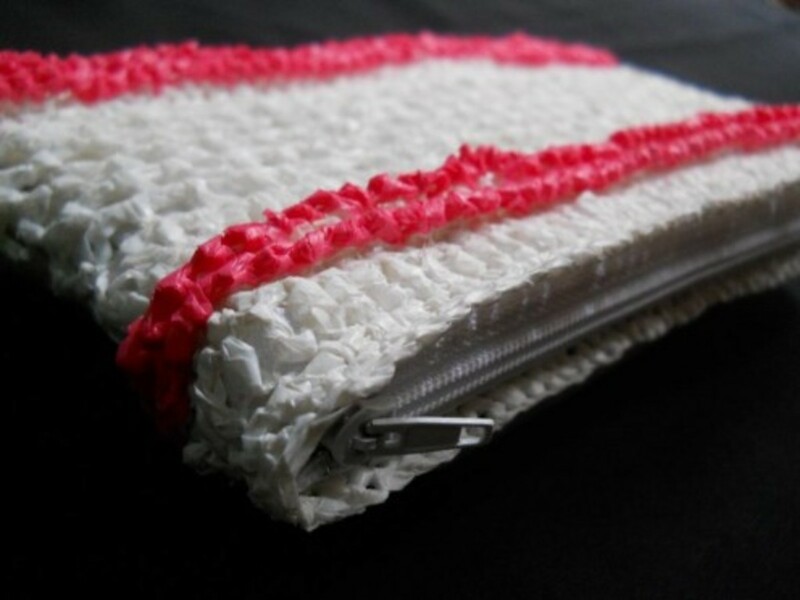 Sew the lining. Crop the corners to lessen bulk. 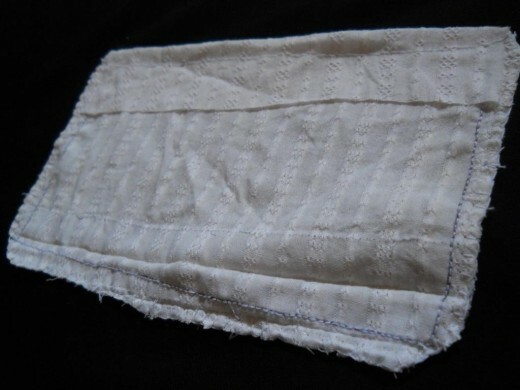 Since I used a cloth that ravels, I stitched the edges to keep them from raveling. 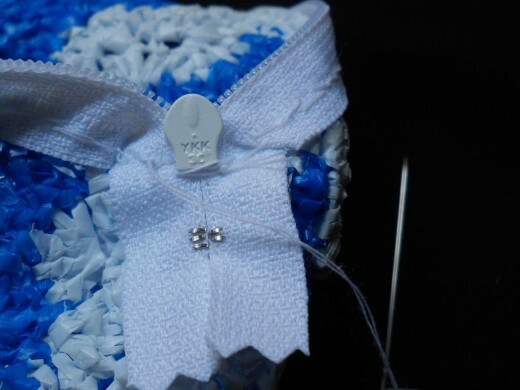 Place the lining inside the crocheted pouch and pin it in place. 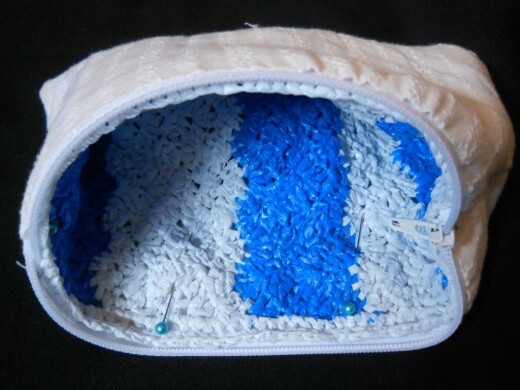 Then turn it inside out so it will be easier to attach the lining to the zipper. 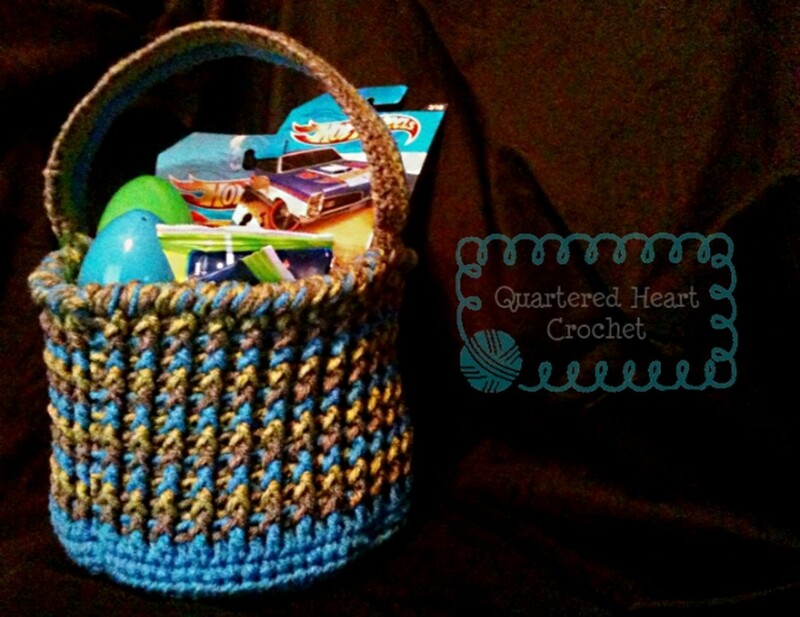 Be sure to match the sides of the lining and the crochet pouch. 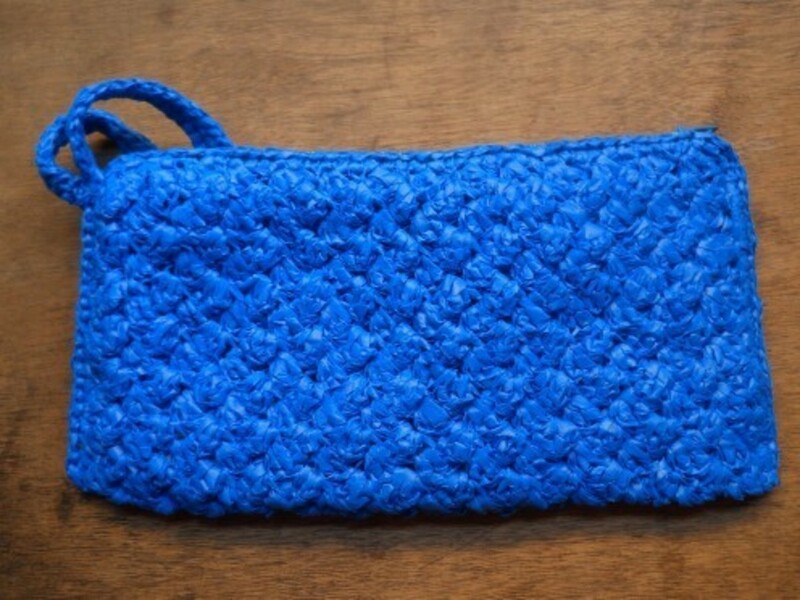 From Carrie Wolf's tutorial, I learned the basics of zipping and lining a crocheted bag. However, I learned a few tricks of my own. Browse the pictures to the right to find out. It's not normal. You could be missing the instructions in the beginning and towards the end. On odd rows you start and end with a full "wave". On even rows, you start and end with a half "wave". It looks great, but I'm having one slight problem... It is getting wider and wider, like a fan sort of shape. Is this normal or am I doing it wrong?